Above: Piotr Szyhalski, IF/THEN: You Decide, detail from The Leaflet Project (from the upcoming Faculty Show at the MCAD Gallery). For more, go to Szyhalski’s excellent Labor Camp. The project is based on propaganda leaflets dropped over Iraq. Charles, Charles Baudelaire. This and more will part of the upcoming Faculty Show at the MCAD Gallery, August 22–Sept.24, 2008. 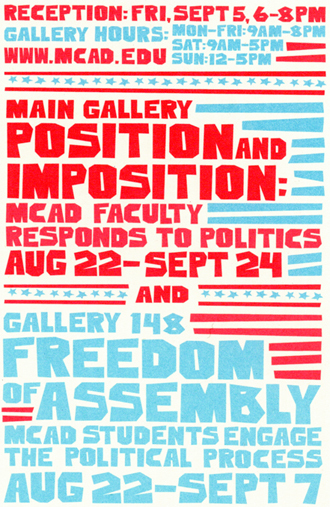 Above: From the MCAD Gallery invitation. to show some new work. This entry was posted by Erik Brandt on Wednesday, August 13th, 2008 at 4:50 PM	and is filed under Aktuell, Art, Free Radicals, Globalization, International, Minneapolis, News Links.